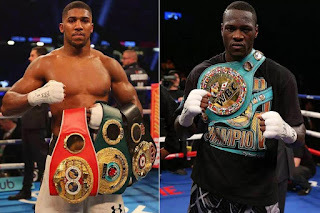 DEONTAY WILDER AND ANTHONY JOSHUA, COULD THIS BE IT? LEAH SHARIBU TURNS 16 TODAY, IN CAPTIVITY!!! Leah Sharibu was among the abducted 109 girls of the Government Girls Science and Technical College, Dapchi in Yobe State. The girls were abducted by the terrorist group, Boko Haram on February 19, 2018. Leah Sharibu who was aged fifteen at the time of the abduction in March 2018 turn 16 today, Monday. While 104 abducted girls were released to their parents, Leah Sharibu was held back by the captives because she refused to renounce her Christian faith. "Wilder is going to be getting a contract from us ASAP," Hearn said. "It's obviously the fight we want. There is a lot of sorting out to do for this fight, but great news that in principle he seems to be on board for the idea of coming to the UK for the fight. We're going to be dealing with it and we're going to be making sure he gets the relevant paperwork." Wilder tweeted : "The $50M offer for him to fight me next in the U.S. is still available. Today I even agreed to their offer to fight Joshua next in the UK. If he prefers the fight in the UK, the ball is in their court. It's up to them to choose." Not long after, we got a picture from Joshua on twitter with the caption "getting ready to rumble". Everybody assumes he is talking about the proposed fight that will turn reality soon. 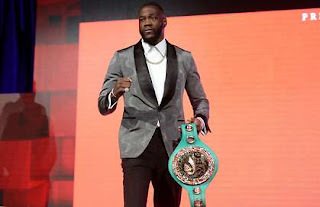 Wilder's co-manager Shelly Finkel fed us some juicy bits, "We have agreed to the terms that Eddie has put out to us for a fight in the U.K. Deontay has accepted his terms to fight in the U.K.," Finkel said. "Deontay sent an email to Joshua [Sunday] night, and I sent one [Monday] to Barry Hearn and Eddie telling them that we officially accept the offer to fight under the terms they gave us and to send us the contract." "Now we will see if they live up to it or if they try to go through with the fight with [mandatory challenger Alexander] Povetkin first. Hopefully, we'll get an answer in the next couple days," Finkel said. "If they change their mind, the $50 million [against 50 percent of the event] we offered them [to come to the United States] is still on the table. That is still for them if they want it." 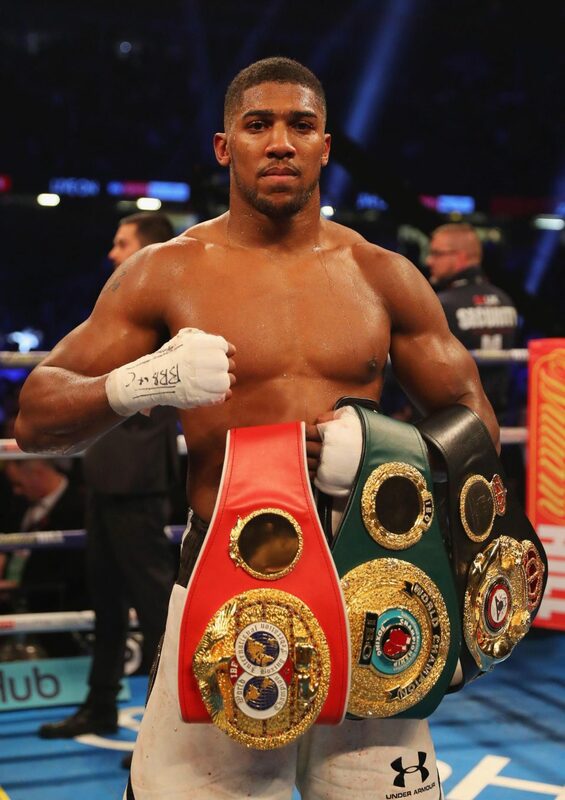 In 2016, Anthony Joshua won his first world championship defeating Charles Martin to claim the IBF belt at London's 02 Arena. Now, he has the IBO, WBA (Super), and WBO titles by defeating Wladimir Klitschko (2017) and Joseph Parker (2018). It seems things are looking up for all the eager fans of AJ and Wilder. Nevertheless, we still want an actual date. If it will be, the fight may take place at London's Wembley Stadium in October or November. You are just 25 years of age or above but you notice weakness and frequent tiredness even when you are just waking up. Research has shown that you are not alone. “If you haven’t heard of Glutathione yet, you will,” says Mark Hyman, MD, founder of The UltraWellness Center in Lenox, Massachusetts in the U.S and a pioneer in the field of functional medicine. “In terms of staying healthy, it is one of the most important molecules in the body." People with higher Glutathione levels: Have less inflammation.Have reduced joint discomfort.Have strengthened immune systems.Have more energy.Have improved stamina and endurance.Recover faster from exercise and illness.Have greater mental clarity and focus.Sleep better.Live better, longer. It's the most powerful anti-oxidant in the world. Contained within our bodies, Glutathione acts as a buffer for any harmful toxins, chemicals or damaged cells that are introduced. The Super Falcons of Nigeria scored 6 goals to Gambia's 0 at the 2018 Africa Women’s Cup of Nations final qualifier at the Agege Stadium. The tournament will commence from November 17 to December 1. On this note, Nigeria has joined Ghana, Cameroon, South Africa , Equatorial Guinea , Zambia, Mali and Algeria at the eight - team tournament. The top three finishers will qualify for the 2019 Women’s World Cup. Desire Oparanozie scored four goals while current Africa Women ’s Footballer of The Year Asisat Oshoala added two as the Falcons bulldozed their West African neighbours. We at Scholars Vine believe in the Super Falcons! Unified world heavyweight champion, Anthony Joshua's promoter, Eddie Hearn will hold a meeting with Deontay Wilder’s team in New York next week. This is to enable negotiations for a fight against Anthony Joshua for all the heavyweight world titles. WBC king Wilder, is yet to accept a flat fee of $12.5m for a massive showdown with the British star, the IBF, WBA and WBO belt holder. Hearn speaking said, “I’m going to look to meet up with them in New York, get face to face with them, look into the whites of their eyes, and just see if we can make a deal. “We made an offer last week. We haven’t heard from them yet. “There’s been a bit of talking behind the scenes. “We are in New York next week for the Danny Jacobs fight and Katie Taylor unification live on Sky Sports." It has been loud, it has been wild, it has been intense with all the electrifying feels of euphoria in the 2017 Calabar Carnival with the dance processions and much more. The Governor, Senator Ben Ayade and his wife, Linda Ayade drove in a red colored Lotus convertible while Nollywood actors like Larry Coldsweat, Zack Orji and Edward Osifu participated in the 2017 Carnival Calabar hot wheels event where over 2 dozen vintage, flashy and customized vehicles drove through the 12 Kilometer Carnival Calabar route. Also participating were the Irish and German teams. Sam Dede later joined in the event but appears more interested in the Bikers parade which kicks off after the Cars parade. Davido has affirmed that he and Chioma are still together. This followed after break up tales from instablog9ja. Instablog9ja had aslo said Davido and Chioma had both unfollowed each other. Replying to an instagram user, Davido referred to Chioma as his wife. 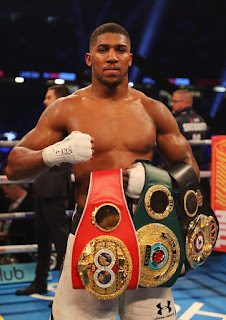 AJ (Anthony Oluwafemi Olaseni Joshua) is at the verge of sealing a heavyweight unification fight deal with Joseph Parker in a deal that is being described as an "overpay" to the New Zealander. Joshua's promoter Eddie Hearn appears to be willing to concede some terms to Team Parker to get the fight sealed, with Cardiff's 78,000 seater Principality Stadium as the most likely venue for the Match. "We're close," Hearn had told Sky Sports UK. "We're at a stage now where we're having to compromise on certain points that we don't really want to, but ultimately we're going to have to because if you want to fight Anthony Joshua, these guys - they want to be overpaid." "He is the golden ticket fight, the 'Willy Wonka' golden ticket fight that everybody wants and unfortunately for him, it's going to mean sometimes taking a deal that isn't right," said Hearn. The 2017 Edition of Soundcity MVP Awards ended during the weekend. The event was at the Eko Convention Center, Victoria Island, Lagos. Ebuka Obi-Uchendu, who will be the host for Big Brother Nigeria (2018) hosted the event. Davido, Olamide, Tiwa Savage and Wizkid emerged winners from some categories. In the Best New Act category, four out of six were Nigerians. Maleek Berry, Mayorkun, Small Doctor and Dice Ailes. Davido, who rode on massive waves of success last year shows no sign of letting up as won three awards for Song of the Year, Video of the Year, and African Artist of the year. He also gave a shout out to his new best friend, Wizkid. After a phenomenal world tour that is being recorded as one of the greatest in the history of Africa, one of Nigeria's superstar, David gave an electrifying '30 Billion World Tour' in Lagos, December, 27th,2017 at the EKO Hotel and Suites, Victoria Island, Lagos, Nigeria. Davido and Wizkid rocked the stage together as they performed "Manya".A pleasantly shocking thriller was presented to the fans last night. Mo'Hits crew which housed Don Jazzy, D'Banj, Wande Coal, Dr Sid, K-Switch, Ikechukwu and D'Prince before their spilt gave years ago used to be a favorite of Nigerians always hitting the airwaves. Positive reviews about the event have been buzzing nonstop on twitter and social media platforms. Davido has dominated the Nigerian music scene with IF, FALL, FIA FIA rising rapidly to the top of the charts. The '30 Billion Concert' was definitely a huge success! The Big Brother Naija 2018 has finally come to an end but there's no slowing down on the entertainment scene as we are all barrelling towards May 5 - the day for the Headies. The organisers of the event have announced comedian Bovi Ugboma and singer Seyi Shay as hosts of the evening. Seyi Shay who recently released a new single, ‘Alele.’ In 2015, Bovi hosted the event with dancer Kaffy. There will be a nominee party on April 28 in Abuja while the main event will hold at Eko Hotel and Suites, Victoria Island, Lagos. Leading the nomination for the Headies is Davido with six nominations, followed by Wizkid, Olamide and Adekunle Gold with five nominations each; Tiwa Savage, Kiss Daniel and Johnny Drille bagged four nominations each while Flavour, Nonso Amadi, Banky W, Niniola, Runtown, Phyno and Reminisce eachhave three nominations.